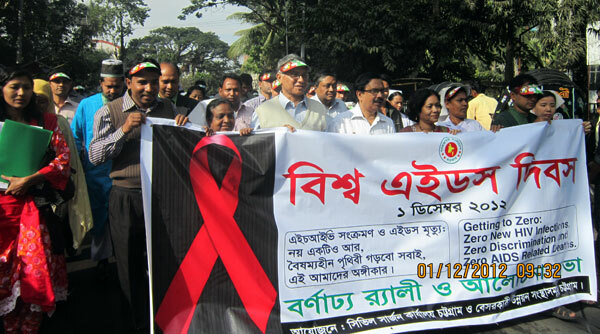 YPSA and HIV/AIDS Coordination Committee jointly organized a procession in front of the Shahid Minar, Chittagong and discussion session at Civil Surgeon Office Auditorium on the occasion of World AIDS Day 2012. Dr. Abu Taybe, Civil Surgeon of Chittagong inaugurated the program. Over 450 representatives from governmental organizations, NGOs, Civil society, and target population individuals attended the rally. Dr. Sheikh Shahabuddin Ahmed, Director of Health Chittagong was the chief Guest and Dr. Md. Salahuddin Mahmud, Additional Director, Health (Admin) was the special guest in the program. Virologist Dr.Abu Mansur Md. Nizamuddin Khaled was the chief speaker of the Discussion Meeting. Deputy civil surgeon Dr. Rafique uddin welcomed all with his speech. Among other Mrs. Khalada Begum, Team leader of YPSA spoke on the meetin.Beside that Modhumita center YPSA has organize discussion meeting with benifitiaries at center on the theme of the day. Theme of this year “Getting to Zero-Zero New HIV Infections.Zero Discrimination and Zero Aid s related Deaths”.